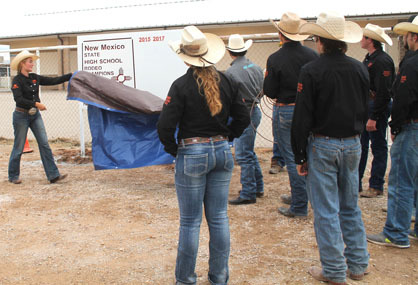 The Artesia High School rodeo team unveiled a state championship sign commemorating its 2015 and 2017 high-school rodeo titles last week at the Artesia Horse Council Arena. Trampas Spence and Mittie Runyan of the horse council petitioned to have the sign built and placed on the grounds. 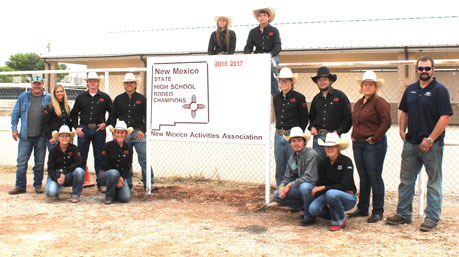 “They are huge supporters of the Artesia High School rodeo team and have also worked very closely with this team since its origination in 2007,” said rodeo coach Kerrie Pitts. The sign was built and generously donated by Rusty Gwynn, owner of Patterson Welding, and was designed by Dee Jay Billips. “Also, a huge thanks to Jon Solt and son, Little Jon Solt, for setting the sign,” said Pitts. Above, the team and its supporters pose with the sign. They are, standing from left, Rusty Gwynn, Kerrie Pitts, Sage Morris, Beau Kelley, Noah Mauldin, Payson Hendrix, Leann Herring, Dee Jay Billips, kneeling from left, Baili Herring, Maddy Deerman, Blaise Milligan, Kenna Sullivan, above sign from left, Kaitlyn Harwell and Jon Solt. Below, Deerman unveils the sign.